"I can't quite see you, but I know you're there." A puppy is born completely blind, his eyes sealed shut. His only way of knowing where he’s at is by sensing mama’s warmth and beating heart. Because his lifelong eyesight depends on proper early development, you’ll want to take special care to protect his eyes in his first days. 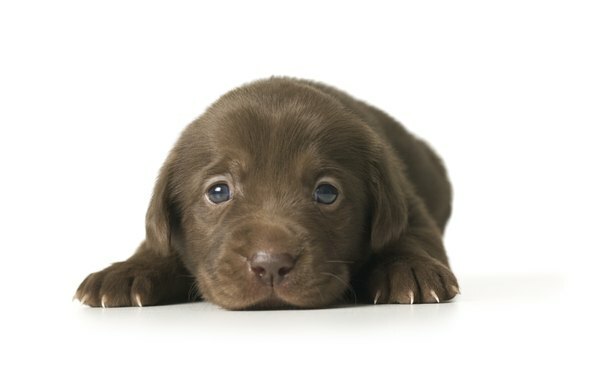 When a puppy’s eyes start to peel open, you’ll know his eyesight development is in the beginning stage. Usually you’ll see his eyes glistening through the lids around 2 weeks of age, according to Cesar Millan's website, Cesar’s Way. The eyes may not open fully until the dog is closer to 4 weeks old. Even though his eyes are slightly open during this stage of development, he doesn’t have clear vision yet. His sight will be limited and blurry in the beginning as his eyes continue to develop. Somewhere around 1 month of age, your little fur ball's sight should be well enough developed that he’ll be able to see something and walk toward it, whereas earlier he had to listen and feel for what he wanted. Objects become more defined rather than still appear as unrecognizable blobs. Even though your puppy’s eyesight will continue to improve throughout the first several weeks of his life, his vision may never be as clear as yours is. When you go to the eye doctor, you have to cover one eye and read a line of numbers. If you can clearly see a certain row at a distance of 20 feet, then you have perfect vision of 20/20. Inability to read lower rows indicates your vision is less than perfect, say 20/40 or 20/60. Dogs can’t read numbers and letters, so a veterinary eye specialist uses black-and-white grids to determine if your pooch can detect a pattern. Some of the best field-of-vision tests on dogs are equivalent to a 20/75 for a human, explains Dr. Stanley Coren, a psychologist specializing in vision, hearing and neuropsychology. Don’t worry about it; dogs don’t rely on eyesight as humans do. Your puppy’s nose is his greatest asset; his sense of smell is his guide for getting around. Since your little buddy’s eyes are in a critical development stage during his first month of life, keep him away from excessive light. Shut nearby windows, put a lower-wattage bulb in the lamp or cover his nesting box with some kind of shade. Bright light too early on can impact the pet's ability to focus later on in life. You’ll also want to watch for signs of infection. Wipe away crust, discharge or other abnormalities with a warm, wet cloth and separate him from the rest of his littermates until you can get him in for a checkup. Eye infections are highly contagious and can spread rather quickly, possibly impacting eyesight development of each pooch. Psychology Today: How Good Is a Dog’s Visual Acuity Compared to That of People? What Does It Mean When a Dog's Ear Is Pointed Back?